This comprehensive examination of short selling, which is a bet on stocks declining in value, explores the ways that this strategy drives financial markets. 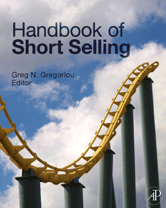 Its focus on short selling by region, its consideration of the history and regulations of short selling, and its mixture of industry and academic perspectives clarify the uses of short selling and dispel notions of its destructive implications. With contributions from around the world, this volume sheds new light on the ways short selling uncovers market forces and can yield profitable trades.